The guys didn't know how to entertain themselves, so they came up wit ha competition. Catch as many lizards as you can before the dusk and complete the challenge. 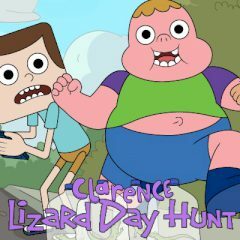 Clarence never thinks of the consequences and always does whatever is currently on his mind. Are you ready to have fun with him and the guys? They are going to catch some lizards on the dump and need your help. Keep your eye on the screen and click on the running lizard before it finds the shelter.